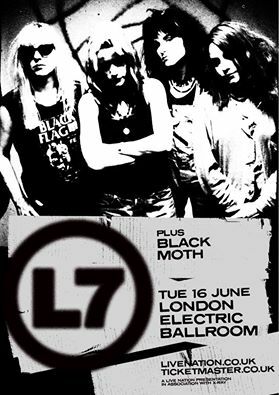 Word from our old friends L7…. Support appears to come from Black Moth. Oh, the tales we could tell about L7 from back there in the days of Atom Seed, “Hey Sean, you know what’s going on, we need an all girl rock band on the label, one like Hole of Babes in Toyland, who should we check out?” Said the A&R man at London Records. This was the early 90’s rock band with grils in them were having thier 15 minute of music industry attention. “But you’ve already go one of the label” said I, “they’re called L7, they’re signed to your American side”, “What?” says he through the haze of white powder-like dust that always seemed to hover over his desk, “I thought that was some kind of catalogue number, are they an actual band, I keep seeing that on paperwork, didn’t know it was the name of a band?” Oh the fun we had back in the day doing the Atom Seed artwork for these people… Will L7 still cut it live? We shall see….